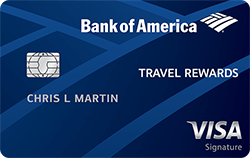 If you’re in the market for a rewards card with no annual fee, Bank of America has your back with its Bank of America® Travel Rewards Credit Card. Every purchase you make with this card (regardless of category or type) will earn you 1.5 points per dollar spent. There are no limits or expirations placed on your rewards total. You can get a pretty simple 20,000-point boost by spending $1,000 during your first 90 days as a cardholder. Bank of America Preferred Rewards clients are eligible for 25% - 75% bonus points, depending on their client level. As is befitting a travel rewards card, this card has no foreign transaction fees meaning you can use it overseas without worrying about racking up additional charges. In addition to the low fee structure and solid rewards program, the Bank of America® Travel Rewards Credit Card also offers a 0% introductory APR on all purchases for 12 billing cycles. As we mentioned this credit card has a generous 12-billing cycle 0% APR on purchases, however this intro APR does not extend to balance transfers. So if you’d hoped to make a balance transfer, this is likely not the card you’d want to use. In addition the Bank of America® Travel Rewards Credit Card has an up-to 29.99% variable penalty APR. This could become troublesome if you make a late payment or miss paying your minimum balance for two months or more. The Bank of America® Travel Rewards Credit Card is a solid rewards card with no annual or foreign transaction fees, making it a great option for travelers and everyday credit card users alike. The 1.5% unlimited rewards rate makes it easy to earn points without having to keep track of rotating categories. 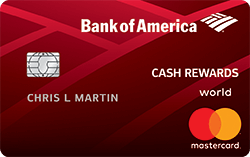 The Bank of America® Cash Rewards Credit Card gives you the opportunity to earn cash back on everyday buys. You’ll get 3% cash back in one choice category and 2% cash back at grocery stores and wholesale clubs, though you can only earn these rates on up to $2,500 of combined grocery/wholesale club/choice category purchases each quarter. All other purchases earn 1% cash back. You can kick off your cash back earnings by receiving $150 for spending $500 during your first 90 days as a cardholder. Bank of America customers can receive a 10% bonus every time you redeem your cash back into a Bank of America® checking or savings account. If you are a Preferred Rewards client, your bonus will increase to 25% - 75%. With such a solid rewards program it’s a wonder that this card doesn’t come with high fees and APRs. Not only is there no annual fee, but you’ll also receive a 12-billing cycle 0% introductory APR on purchases and on balance transfers made within 60 days of your account’s opening. The most obvious rewards-based drawback of this card is the combined cash back spending limit of $2,500 in one choice category, grocery store, and wholesale club purchases each quarter. While it shouldn’t significantly weaken what you can earn, this cap will definitely affect some. The penalty APR of up to 29.99% variable is also worth keeping an eye on. If you make a late payment or miss paying your minimum balance for 60 days or more, this penalty APR will apply on top of the regular APR. The Bank of America® Cash Rewards Credit Card is an excellent option for those looking for a no annual fee credit card that rewards spending on everyday purchases. Bank of America customers can earn a 10% bonus when redeeming cash back into a Bank of America® checking or savings account. Anyone in the market for a balance transfer credit card should consider the Chase Slate® credit card. You won’t be charged a balance transfer fee on balances you transfer during the first 60 days you have the card. You’ll also receive a 0% introductory APR on balance transfers and purchases for 15 months. There’s no annual fee with the Chase Slate® credit card and you’ll have unlimited, free access to your FICO® credit score free. The 15-month, 0% introductory purchase and balance transfer APR of the Chase Slate® credit card begins at account opening. On the other hand, the $0 introductory balance transfer fee is only available during the first 60 days. Unlike many of its competitors, this card doesn’t offer the opportunity to earn any rewards. In a hurry to make a balance transfer? The Chase Slate® credit card could be right for you. With 0% intro APR for 15 months from account opening on purchases and balance transfers and the added benefit of the first 60 days being free of a balance transfer fee, this card stands out in a crowded field. $0 Intro balance transfer fee for the first 60 days your account is open. After that, the fee for future transactions is 5% or the amount transferred with a minimum of $5. 0% Introductory APR for 15 months on purchases and balance transfers. After that, 17.24% - 25.99% variable APR. Whether you travel for business or pleasure, the Chase Sapphire Preferred® Card can help you do it cheaper. Any travel or dining purchases you make with this card will result in 2x points per dollar spent, while every other dollar you spend will earn 1 point. Building up a large points base quickly is doable with this card as spending $4,000 during your first three months as a cardholder will earn you a 50,000-point bonus. And when you book your travel plans through Chase Ultimate Rewards®, you’ll get 25% more value for the points you’re redeeming. You can also transfer your points to partner travel programs typically at a 1:1 ratio. Partner airline programs include British Airways Executive Club, Flying Blue AIR FRANCE KLM, Korean Air SKYPASS, Singapore Airlines KrisFlyer, Southwest Airlines Rapid Rewards®, United MileagePlus® and Virgin Atlantic Flying Club and partner hotel programs include IHG® Rewards Club, Marriott Rewards®, The Ritz-Carlton Rewards® and World of Hyatt. You won’t have to pay an annual fee for the first year you have the Chase Sapphire Preferred® Card, opening up a real chance to boost your rewards right off the bat. And feel free to take your card with you when you’re traveling abroad, because you won’t be subject to a foreign transaction fee on purchases made outside of the U.S. While you’ll get an introductory annual fee rate of $0, that will jump up to $95 following your first year. For some, an annual fee is a real drawback so you’ll have to decide if the card’s many benefits are worth it to you. It’s also worth noting that there are no introductory APRs with this card, a perk that many other travel-centric cards offer. This means you’ll face a variable APR between 18.24% and 25.24% right off the bat. The Chase Sapphire Preferred® Card offers some of the best and most sustainable travel rewards benefits of any such card on the market. If you like to travel, and do it often, you’ll want to consider this option. You can chose to redeem points at a number of travel partners, so you don’t need to worry about being loyal to a single airline or hotel. Alternatively, you can book your travel directly through Chase Ultimate Rewards® and earn extra value for the points you’re redeeming. 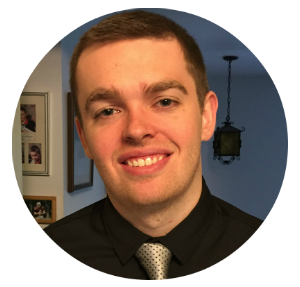 Students and younger people in general typically have a harder time getting a solid credit card, as they usually haven’t had the chance to build up much credit history. However, the Discover it® for Students is beginning to shift that script. First of all, there’s no annual fee with this card, which is a positive for students who may be on a tight budget. Second the card has a six-month 0% intro APR on purchases. While it’s always best to pay your credit card in full (and on time) every month, this is not always possible. This 0% intro APR gives students a little wiggle room at the beginning should they need it. Each quarter, cardholders can earn 5% cash back in rotating categories that you activate up to a specified amount. Outside of those categories, cardholders earn 1% cash back. Then at the end of your first year with the card, Discover will match your overall earnings, doubling your cash back total. Keeping your grades high has a major incentive as well, as those with a GPA of 3.0 or higher will get a $20 statement credit each school year, for up to five years. There aren’t many negatives to this student-focused card, but its 15.24% to 24.24% variable APR range could afford some young cardholders with a possibly expensive interest rate. Discover will forgive your first late payment though. Students are usually forced to stick to debit cards or cash, but the Discover it® for Students is an excellent option for young people looking to start building credit and learn how to use credit wisely. The card has no annual fee and gives students the opportunity to earn some cold hard cash back for their spending. Receive Free Social Security number alerts-- Discover will monitor thousands of risky websites when you sign up. For those looking to build their credit from the ground up or repair their damaged credit, the Capital One® Secured Mastercard® offers a safe and beneficial way to do just that. You’ll start off by making a $49, $99 or $200 refundable security deposit to Capital One to cover your opening credit line of $200. You can deposit more money before your account opens to receive a higher credit line. Your security deposit amount will depend on your credit score and history. If you make your first five monthly balance payments on time and without incident, you’ll be given the chance to raise your credit limit without having to lay any more money on the line. There’s no annual membership fee for cardholders, giving you a prime, low-cost opportunity to make sure you improve your credit. Capital One also offers a helpful credit monitoring service called CreditWise®, which cardholders get unlimited access to. You can use this whenever you’d like to see how your recent decisions are forming your credit’s future. The 26.99% variable APR that all cardholders receive is pretty solid in comparison to other secured credit cards, but it’s still considered a high interest rate. This is likely the “missing piece” of any secured card, but it’s worth noting that the Capital One® Secured Mastercard® does not come with any rewards system. As far as secured credit cards go, the Capital One® Secured® Mastercard offers a simple credit-building program that affords plenty of benefit to cardholders who use it correctly. As a small business owner, you’re likely looking for ways to save money or get a return on your many investments, and the Ink Business Preferred℠ Credit Card will allow you to do just that. Every dollar you spend up to a combined $150,000 on travel, shipping, internet/phone services and advertising on social media and search engines will earn your 3 points with this card. All other purchases will yield 1 point per dollar. If you charge $5,000 or more to your card during your first three months as a cardholder, you can quickly boost that total by 80,000 points. Then, redeem your earnings through Chase Ultimate Rewards® to cover any travel costs you might have, and receive 25% more value on your point total. If you’d like to have connected cards given to your managers or other employees, there’s no extra fee to do so. And if you or your employees’ trips are ever abroad, you can bring your Ink Business Preferred℠ Credit Card with you as there are no foreign transaction fees to fret about. There is a $95 annual fee for this card. That’s not a particularly high fee for a business card but it’s still one you should be aware of. You’ll also want to make sure that you stay on top of your payments as there is an up to 29.99% variable penalty APR if you miss making a minimum payment or your payment is returned. If traveling is an overbearing expense for you and your small business, the Ink Business Preferred℠ Credit Card can help significantly ease that strain by giving you rewards points that will eventually lower your overall cost. If you’re someone who enjoys keeping track of rotating bonus rewards categories, the Chase Freedom® card is likely the perfect fit for you. With this card, you’ll have the opportunity to earn 5% cash back in rotating categories – as long as you activate. This applies for up to $1,500 in combined purchases each quarter. You’ll earn 1% cash back on purchases in all other categories. You can also earn $150 cash back if you spend $500 during your first three months with the card. Cards with so much direct cash back potential often have higher maintenance costs to offset those rewards, but that isn’t the case here. Not only is there no annual membership fee, you’ll also receive a 0% introductory APR for 15 months on both purchases and balance transfers. The 5% cash back rate is simply unmatched in most other cash back cards. However, because that rate only applies to $1,500 in combined purchases each quarter, that earnings rate will cap at $6,000 each year. Plus, rotating categories must be opted into each quarter, or you will receive the base earnings rate of 1%. The Chase Freedom® card offers cardholders a significant amount of bonus cash back on specific categories that change throughout the year. All other purchases earn 1% cash back. This is an impressive rewards system, especially given the fact that there’s no annual fee on this card. 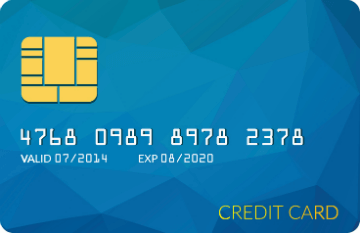 Methodology SmartAsset has developed a quantitative and independent system for evaluating the relative value of a credit card offer versus other offers in the marketplace. Our system evaluates cards based exclusively on their features, such as their rewards earning rate (if applicable), fees, perks, and rewards program redemption options. The annual rewards values on this page are calculated using annual spending assumptions in various categories such as, but not limited to, gas, restaurants, airfare, and US supermarkets. These spending assumptions are built on research that SmartAsset has conducted on existing 0% APR credit cardholders. Our promise with our credit card recommendations is that we will always strive to have the most comprehensive, accurate, and objective method of evaluating credit card offers. Any recommendations are solely determined by the result of this research and model, and is never influenced by any fees, commissions, or other forms of compensation that SmartAsset may receive from credit card issuers for leads generated on our website. SmartAsset’s interactive map highlights the places in the country where people have the lowest credit risk and are most likely to be approved for their next card. Click between states and the national map to see the best places to apply for a credit card. Methodology Our study aims to find the best places to apply for a new credit card. To do this, we analyzed three factors: credit score, credit utilization and late payments rate. These are three of the factors used by credit card issuers to determine whether an applicant is approved or denied for a new credit card. To calculate our rankings, we indexed each factor and calculated an overall index by taking a weighted average of each of these indices. We weighted credit score as 40%, credit utilization as 30% and late payments rate as 30%. The top-ranking cities and states had a high credit score, low credit utilization and a low late payments rate. This means people there are a low credit risk and more likely to be approved when applying for a credit card.